These are one of my favorite appetizers, so I thought it would be a good idea to share them this month in time for Thanksgiving. I tried fried green beans for the first time quite a few years ago and I absolutely loved them. I have ordered them a few times since, but I never thought about making them at home until this past summer when I had a huge pile of fresh green beans from are garden. They are battered with a simple beer batter recipe and fried quickly. The batter has a wonderful flavor and the texture pairs perfectly with the crunch of the green beans. The dipping sauce is a recipe that mimicks the sauce that is served with the fried green beans at P.F. Changs. The sauce has the perfect amount of spice, however if you would like less spice you could always add less of the chili sauce. I highly recomend these green beans for your holiday appetizer menu or any appetizer menu for that matter. Also, this particular batch of beans was truly made from scratch as we used my husbands home brewed beer in the batter and the green beans were home grown in our garden. Just another pure and yummy bonus! 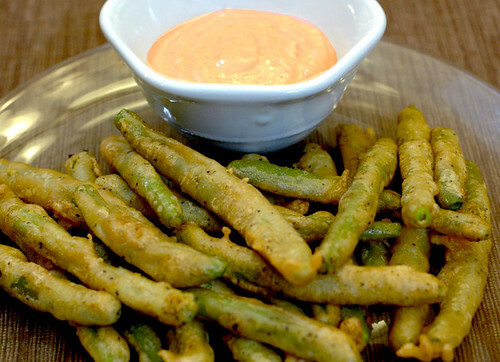 Preheat oil to 375 degrees F.
Dip green beans into batter to coat, letting excess drip off. Fry in the oil in batches, until they are golden and crisp. Remove from oil to a paper towel lined sheet tray. Sprinkle with salt and pepper. Place ingredients in blender or food processor and mix til smooth. These look delicious. A nice alternative to chips and fries! I LOVE fried green beans! And the dipping sauce sounds outstanding. I’m making this. OMG my favorite! So tasty and gorgeous! Great job! Green beans as dippers? Love it. I included it in my Thanksgiving Sauce and Dip roundup post today. I am so glad that you liked them! We love them a lot! Welcome to pure & yummy! As most of my friends and family know, I love to cook and bake. I mostly love to eat the finished product, but getting there is very fun too! :) I decided to start this blog to share my food adventures with the rest of you and to keep all of my experiences and recipes in one place. I hope you all enjoy this culinary journey with me! Pure and Yummy Has It’s Own Domain!